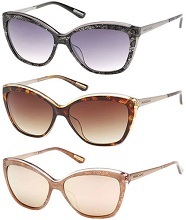 Trendy and Stylish Cat Eye Designer Sunglasses for Women by Fendi, Alexander McQueen, Tom Ford, Dior, Guess and more. Beautiful butterfly shaped cat eye acetate frame sunglasses with Alexancer McQueen etched on temples. Renowned for impeccable craftsmanship and design integrity. The Fendi 0041/S otherwise known as the 'Irdia' has been an eyewear icon since 2014. Half rim cat eye, embellished with pyramid crystals on the edges of the frame. Elegant yet fashionable cat eye sunglasses. Mirrored lenses with clear view. Protect your eyes with these stylish AngeliqueS sunglasses by Kate Spade. Tom Ford cat eye eyewear collection introduces frames that are strong, yet architecturally simple in design. Alexander McQueen sunglasses are constantly inspired by nature. An example is these beautiful cat eye style sunglasses. Lee Alexander McQueen was a British fashion designer and couturier. Handmade, oversized rounded cat eye shape with adjustable nose pads. Available in both classic solid and soft mirrow finishes. Frame Material: Acetate / Metal. Marciano is the exclusive echelon line by Guess. Marciano's acetate cat eye blends various color schemes and translucent hues into an elegant, affordable and stylish eyewear piece. People with a heart shaped face will find that cat-eye styles of glasses that feature rounded edges are ideal for giving the wearer a more balanced look.